Bannon spoke a day before Alabamians go to the polls in the Republican Senate primary race between Judge Roy Moore and establishment-backed Sen. Luther Strange (R-AL). He spoke before a packed crowd alongside Brexit mastermind Nigel Farage and Duck Dynasty’s Phil Robertson. In his address, he pointed out the enormous media presence in Alabama and said it was because the media knows what is at stake in the race. The establishment Republican Party has poured tens of millions of dollars into the race as it seeks to get its candidate over the line, but polls have consistently shown Strange trailing, sometimes by double digits. 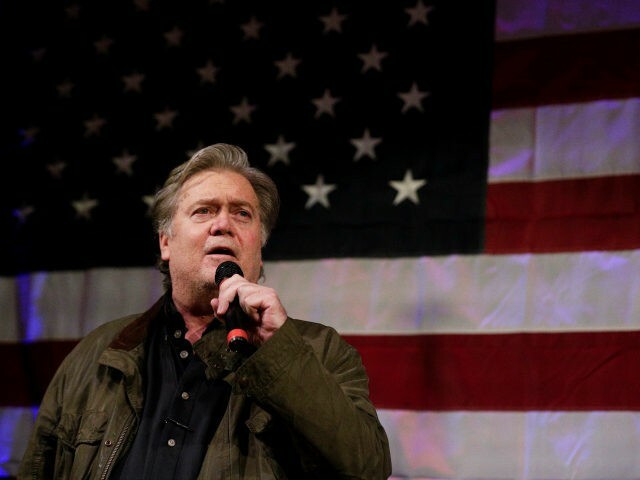 Bannon told the crowd that Tuesday represents a chance for Alabamians to be heard by the corrupt elites in the capital, who he noted think that Alabama can be won over with 30-second TV spots. “They think you’re a pack of morons, they think you’re nothing but rubes, they have no interest at all in what you have to say, in what you have to think or what you want to do. And tomorrow you’re going to get an opportunity to tell them what you think of the elites that run this country,” he said to wild applause. “For Mitch McConnell and Ward Baker and Karl Rove and Steven Law — all the instruments to try and destroy Judge Moore and his family: Your day of reckoning is coming,” he said. “More important, for the donors who put up the money, and the corporatists who put up the money: your day of reckoning is coming too,” he added. Bannon described those elites as people who “know the price of everything but the value of nothing” and he reflected on what that means for their candidate, Luther Strange. After a brief interruption by a protester, Bannon finished his address with a firm statement to Alabamians, urging them to stand up to the elites in D.C.